When your physical or mental health is a struggle self-care is often one of the first things to be dropped, even though it's the time it's needed most. The Blurt Foundation is a social enterprise working to raise awareness and understanding of depression and one of the fantastic ways they do that is through their 'Buddy Boxes' which they describe as 'a hug in a box'. The boxes can be bought as one-offs, or monthly subscriptions and they contain at least 5 products hand-picked to nourish, inspire and encourage self-care. These items can include products for physical pampering or books on self-care, information to help you have better interpersonal relations (e.g. a guide on learning to say no) or cute badges or stationary to treat yourself. 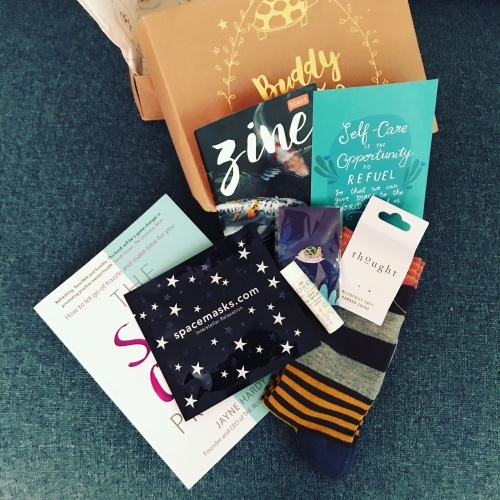 My first box turned up recently and was all about self-care with some wonderfully soft bamboo socks, lovely foot balm and a warming eye mask which I'm going to treat myself with later. It also has a very cute & colourful enamel pin and an interesting looking book 'the self-care project' which I need to dedicate some time to reading. You can even treat someone else to a Buddy Box either as a gift to someone you know (which can be anonymous) or to someone the Blurt Foundation knows needs one.